Sharing a name with Kansas City, Missouri is another wonderful and vibrant city—Kansas City, Kansas. Kansas City, Kansas is a city filled with culture, fun and cuisine. They pride themselves on having some of the best barbeque in the country, and there are plenty of places in the city to get some of the best smoked meats you’ve ever had! For entertainment, you’ll want to visit 7th Street Casino, 403 Club or the Boulevard Drive-In and Swap N’ Shop. If you are looking for a romantic outing during the day, you can visit Rowe Ridge Vineyard and Winery. For racing fans, you’ll want to check out Kansas Speedway! This 15 mile tri-oval speedway hosts two NASCAR races and more! Whether you are looking to catch a thrilling race or eat some delicious barbeque, Kansas City, Kansas is a city you’ll definitely want to visit. Howl2GO by Howl at the Moon is the premier name in Dueling Piano entertainment. Bring our incredible performance to your event in Kansas City at any venue. Bringing Howl2GO’s show to any venue in Kansas City means you’ll be getting only the country’s top Dueling Piano performers. All our performers are young, exciting and high energy, as well as being experienced in playing all types of events anywhere in the Kansas City area. Howl2GO provides all the production you need to make your event look and sound amazing. We have top of the range PA sound systems and custom built lighting shows that you will not see anywhere else. Our competition simply does not begin to come close to our production! We also supply our custom built electric baby grand pianos that can be transported into any size or shape venue in the Kansas City area. Regardless of how many guests you’re expecting, from 20 to 2000, we have you covered! Howl2GO Dueling Pianos by Howl at the Moon brings only the absolute best entertainers to your event. Whether you’re planning a corporate event in Kansas City, a wedding or private party at your home, we’ll deliver customized entertainment leaving you and your guests dancing and singing along all night. We are the first choice for all types of school, church and charity fundraisers and we ensure all our songs and material is suitable for everyone in attendance. Telling your guests in Kansas City that Howl at the Moon is providing the entertainment, is a sure fire way of attracting more people to your event! 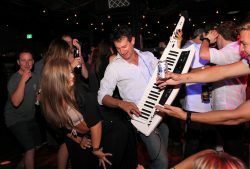 Howl2GO is the only dedicated Dueling Pianos company in Kansas City and our team works tirelessly to ensure your event is perfect. Our production team will deal directly with your Kansas City venue and, in conjunction with our Wedding Specialist, sales director and our amazing piano players, create a customized event just for you. Our Howl at the Moon musicians will take you guests’ requests live just as they do in one of our many nationwide venues. 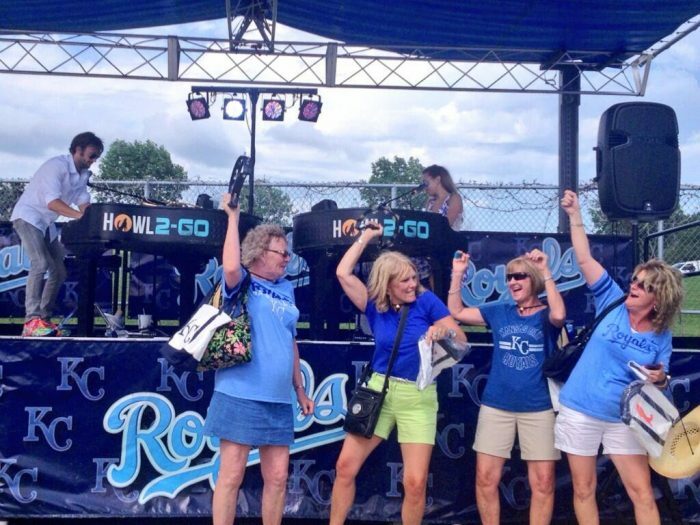 Since our inception in 1990, Howl at the Moon has been the number 1 place for bachelorette parties, and now Howl2GO has become the number one choice for Kansas City area Dueling Piano wedding entertainment. From your ceremony, through announcements and you first dance until the last guests leave the dancefloor following your reception, our live Wedding music will keep everyone on the dance floor all night long. Choose us, the experts in Wedding entertainment, and don’t take a chance on a local act who will not provide the professional performance required of the biggest night of your life! We have a dedicated reviews page so you can read testimonials from hundreds of our thrilled clients in Kansas City. Our Facebook page features regular updates, and following us on Instagram and Twitter means you’ll stay up to date on where we’re playing next near Kansas City KS.